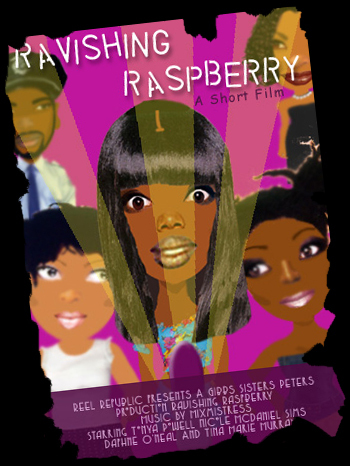 "Ravishing Raspberry," a mixed media animation, takes a glimpse into the life of Nyesha, a young woman desperate to look her best for a girls-night-out. An empty make-up case and a popular shade of lipstick, "Ravishing Raspberry," leads Nyesha to make a critical choice that leaves her evening more memorable than she could ever imagine. The story is a commentary on the materialistic mindset shared by many of today's youth and how it is fueled by the media, music videos and advertising. Starring: Tonya Powell, Nicole Mc Daniel Sims, Daphne O'Neal and Tina Marie Murray. With Susie Butler, Jay, Clarence Johnson, Jacquline Butler-Drummer and Mary Ann Tidwell.